It will be a third consecutive term at the Invicta Dynamos for 21 year old forward Joshua Condren after the speedy skater agreed terms to remain in Kent where he will be looking to add to his 89 appearances in a Mos jersey since his arrival in the summer of 2015. Joshua Condren was one of numerous young faces to join the Dynamos in 2015 as Head Coach Kevin Parrish undertook a major reshuffle of his side and he arrived at the SIlverBlades having risen through the junior ranks in Guildford, represented Slough at under 18s, NIHL South Division 2 and EPL level and having iced with the London Raiders for a full year in the NIHL South’s top tier. In his first season in Gillingham, Condren featured in all but one of the team’s 50 games and he found the net 12 times whilst playing a role in 12 more for a total of 24 points. He would also earn a reputation as a powerplay magnet as he repeatedly drew penalties from opponents who struggled to adapt to his unorthodox style and responded to his on ice agitation. After a successful first term, Condren quickly committed to another and in 2016/17 was a part of the Dynamos team that would finish the season by lifting the NIHL South Division 1 playoff trophy in April. This time the plucky forward featured 40 times, notched 4 goals and 11 assists for a total of 15 points. Now he will be hoping to continue his development as he returns to the Mos again to make It three seasons in Gillingham where the club will now feature in British ice hockey’s second tier for the first time since 2002/03. Speaking on the re-signing of Joshua Condren, Head Coach Kevin Parrish said, “Josh brings pace, work rate and little bit of the unpredictable to the ice and each of those will be required in abundance next year given the new level of competition we’ll be facing. At 21 he’s still young and developing but he already has a knack for grabbing important goals, his hassling style helps generate turnovers and makes things happen and his edge helps draw penalties and get us on the front foot. The Josh we have at the club now is a long way from the Josh that first signed on the dotted line here in 2015 and I’m confident that he will continue to improve and become an increasingly important player for us as the season goes on. He loves the club, he loves the fans and he loves playing the game here in Gillingham and so I look forward to working with him again when 2017/18 gets underway”. 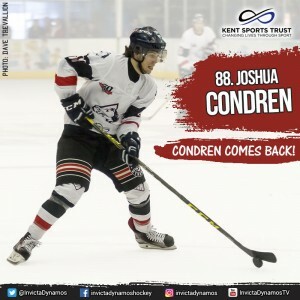 Joshua Condren will continue to wear number 88 at the SilverBlades and he is the seventh player to be announced by the club ahead of the new season as he joins Damien King, Ondrej Zosiak, Tommy Ralph, Mason Webster, John Dibble and Bobby Chamberlain on the team sheet for 2017/18. 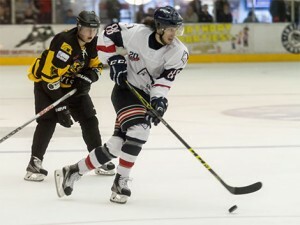 Warm-up Jersey – For just £125 get your name or logo printed on the back of Joshua Condren’s warm-up jersey. Sponsors are also named on our website and in our match day programme and then presented with the jersey to keep at the end of the season. Game jerseys – For just £250 for individuals / £300 for businesses get your name or logo on the back of Joshua Condren’s game jerseys. Sponsors are also named on our website and in our match day programme, are announced over the loudspeaker during player introductions at every home game, receive a programme advert (business sponsors only) and are presented with the jersey of their choice at the end of the season. Contact Jackie Mason by email at dynamosicehockey@aol.com for player sponsorship details or enquiries.